In the early Middle Ages, Scandinavian influence on British life, language and culture was profound. The Vikings had a major and lasting impact, and their legacy still resonates strongly in modern constructions of British identity and heritage. Scandinavian settlement began in earnest in the late ninth century, especially in the North and East of England, and probably its most enduring and significant effect was on the English language. The Gersum project aims to understand this Scandinavian influence on English vocabulary by examining the origins of up to 1,600 words in a corpus of Middle English poems from the North of England, including renowned works of literature like Sir Gawain and the Green Knight, Pearl, and the Alliterative Morte Arthure. The Gersum Conference will take place at St Catharine’s College, Cambridge on September 5-7, 2018. This conference will explore the historical and cultural contexts and legacies of Anglo-Scandinavian encounters in the Viking Age from cross-disciplinary perspectives. Gersum Project’s focus on the Norse impact on the English language itself with be brought into conversation with the study of archaeology, literature and inscriptions; with the North Sea and Irish Sea regions more widely; with lexicography and dialectology; and with Norse influence on the onomastic record. Speakers include Lesley Abrams, Jayne Carroll, Philip Durkin, Nik Gunn, Judith Jesch, Jane Kershaw, Máire Ní Mhaonaigh, David Parsons, Elizabeth Ashman Rowe, Sara Pons-Sanz, Brittany Schorn, Matthew Townend, Thorlac Turville-Petre and George Walkden. 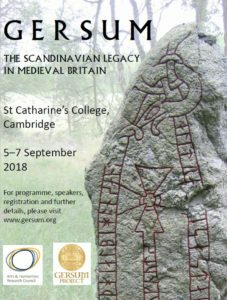 To register, please visit https://onlinesales.admin.cam.ac.uk/conferences-and-events/anglosaxon-norse-and-celtic/gersum-conference/gersum-conference. Accommodation for the conference is available at St Catharine’s College, and can be booked directly at https://www.caths.cam.ac.uk/event/accommodation-gersum-conference-2018#overlay-context=event/accommodation-gersum-conference-2018/register. Read the Gersum Conference Abstracts here. The Gersum Conference programme is now available! View it here. Save the date! The Gersum Conference will take place on September 5-7, 2018 at St. Catharine’s College, Cambridge. Registration is open: here. New blog post by Richard Dance on ‘Vikings in Your Vocabulary’! Check it out here. Sara Pons-Sanz gave the Helen Thirza Addyman lecture on ‘Tracing and Classifying Norse Influence on English’ in York on February 14, 2018. Find more and book your tickets here.